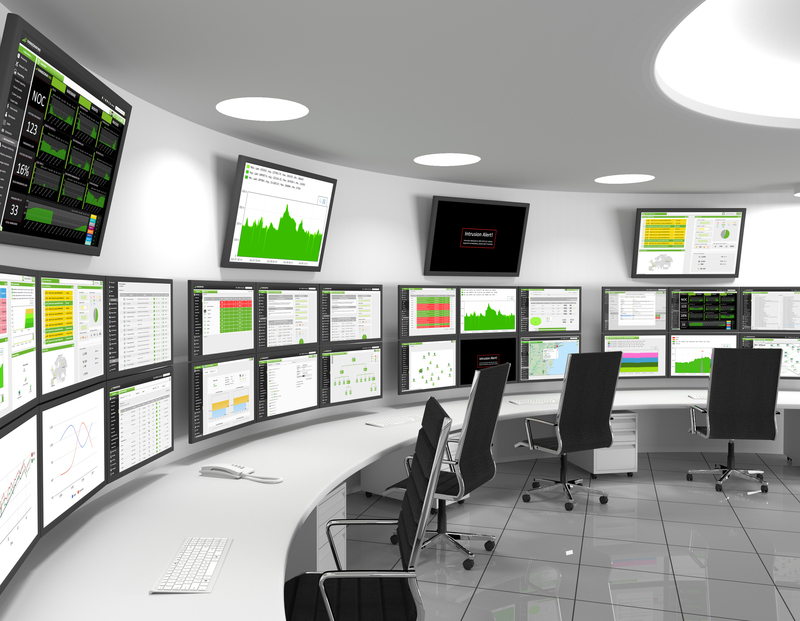 An innovative and high-performing display technology is among the essential building blocks of a reliable control room monitoring system. Industries like automation, broadcasting, medical and other similar areas needs a uniform distribution of information. Such industries also require steady interactive display solutions (Video wall, professional AV etc) to make critical decisions and deliver accurate solutions. Control room display solutions normally range from a desktop screen, which is used to view data from various sources to a large-scale video wall display. The large video walls are ideal for representing vital graphics/information required for collaboration and taking vital decisions. 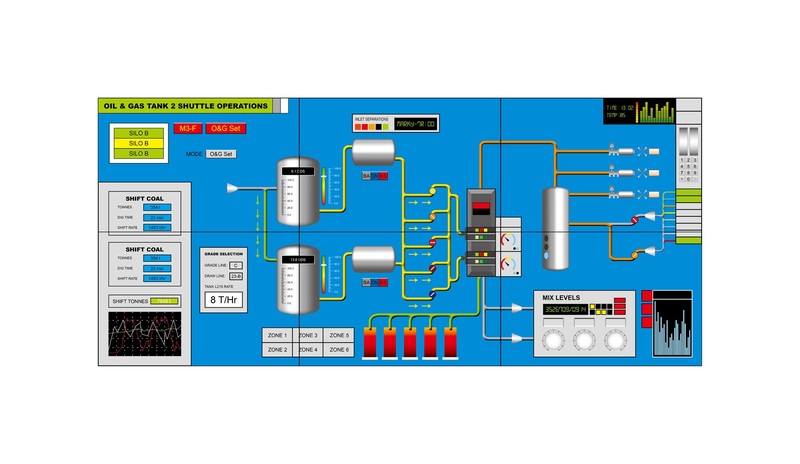 Arista control room display solutions are designed considering the fact that display solutions needs to be durable and sturdy. Arista industrial control room display solutions allow users to discover whole new way of enhancing employee’s productivity, customer engagement and overall business growth. Arista offers one-stop display solutions, the control room range includes video wall, multi-display output thin client, 4K Display output Thin Client, Quad-View video controller, and video extenders. Keep on reading below to know more about Arista video wall display product, ADM-5855VW. The ADM-5855VW LCD Module has a 55 inch screen with super narrow bezel, this professional grade high-resolution LCD is perfect for small, medium, and large sized control rooms. ADM-5855VW embeds a self-contained controller with easy to use functionalities. The LCD video wall display can be VESA/wall mounted and is pre-configured for immediate use. Arista ADM-5855VW LCD Module for video wall has a built-in controller; all modules are daisy chained and can accommodate multiple screens as per space. 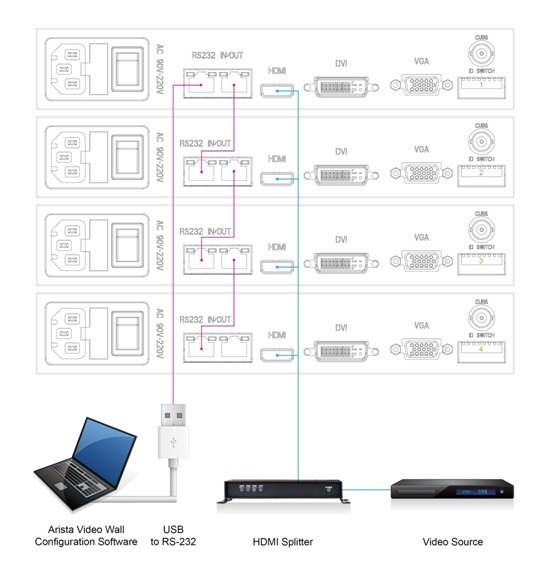 The video source of each LCD module feds video signal via video splitter outputs and video splitter video input is connected to original video source. The setup software runs on the computer which communicates with video wall via RS-232 interface or via USB to RS-232 interface. The setup software allows users to define the layout of video wall and adjust the width of LCD module bezels. After the setup data is stored in the controller of the LCD modules, the setup remains the same every time the video wall is powered on. Only when the layout is changed user has to setup the software again. Refer the diagram below for connection of the video wall. Cost Effective with latest functionalities: Arista ADM-5855VW 55” Full HD TFT LCD display requires minimal investment and embeds multiple functionalities for the ease of user control. There is no separate expensive video wall controller required and the system can be pre-configured for immediate use. The ADM-5855WV has capabilities for expansion of upto 8×8 display panels and supports multiple signal input types including CVBS, VGS, DVI and HDMI with a resolution upto 1080p@60-Hz. Arista Corporation has several decades of experience in building, designing and manufacturing industrial computers and displays. With headquarters in Fremont California, Arista has offices in China, Taiwan, and India. Our website www.goarista.com provides detailed information about products, parts, technical support or any query. Contact sales@goarista.com or support@goarista.com for any information, you can also call us at 1.877.827.4782 Monday through Friday PST 8:00am to 5:00pm to speak to our staff.